On 15 December 2017, an Agreement was signed by the UNESCO Director-General, Ms Audrey Azoulay, and the Ambassador and Permanent Representative of the Netherlands to UNESCO, H.E Lionel Veer, to designate the IHE Delft Institute for Water Education as a Category 2 Institute under the auspices of UNESCO. The Institute is a leader in the field of postgraduate water education. It was established in 1957 and functioned as a Dutch educational establishment for more than half a century, before becoming UNESCO-IHE, a category 1 Institute, from 2003 to 2016. Its three main areas of work include postgraduate water education, research and capacity development for developing countries and countries in transition. In total, over 15,000 water professionals and postgraduate students from over 160 countries (mostly developing countries) have been studying and conducting research at the Institute since its creation. 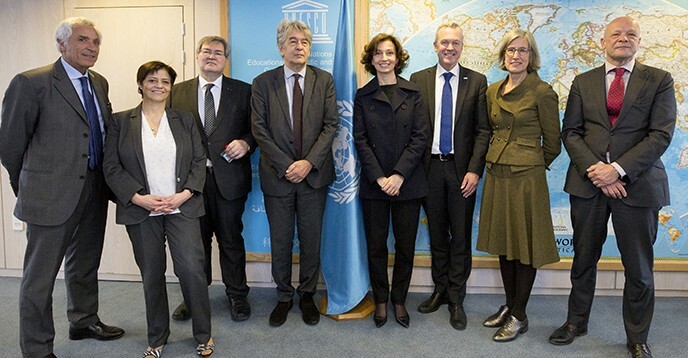 Through this new commitment, UNESCO and IHE Delft will continue their strong cooperation towards the achievement of the current Strategic Objectives of UNESCO’s International Hydrological Programme, and will contribute to the Sustainable Development Goal focused on the sustainable management of water and sanitation for all (SDG 6) of the 2030 Agenda for Sustainable Development.